Just because you want a college Christmas tree for your dorm room, that doesn't mean you have to settle for a basic green dorm Christmas tree! Maybe you want something a little more different and unique for your dorm room. You want something that will pop and make your college dorm room different from the others on your college dorm room floor. After all, you added unique dorm essentials to your college dorm checklist to make your college dorm room one of a kind while living on campus. Christmas is no exception! Even during the holidays you still want your college dorm room to be a cool, comfortable place to hang out. For unique dorm necessities for your dorm room decorating for the holidays, look no further than our Sky Blue Laser Dorm Christmas Tree! This dorm essentials item has a cool, bright blue color that will add a pop of style to your dorm room decorations. Plus blue is a relaxing and calming color, which makes your holiday dorm room decor even more comfortable. Add some garland and bulbs to this dorm item and your dorm Christmas decorations will be complete! What about the dorm mini lights, you wonder? Well this dorm essentials item already has them attached on the Christmas tree! 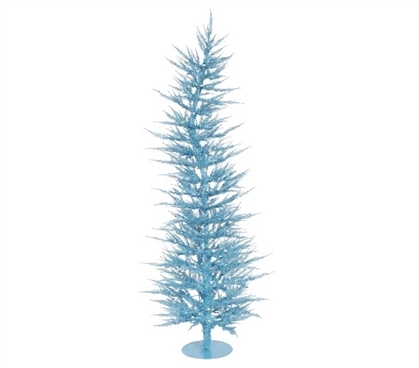 Plus in a cool blue color that matches the branches, your dorm room decor will be complete for the holidays!